You are in control - with four different settings: In only, Out only, Fully locked, Fully unlocked. 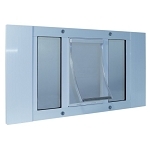 The PetSafe 4-Way Locking Cat Flap is designed to be mounted in doors or walls and can also be used for very thin applications such as a screen door. 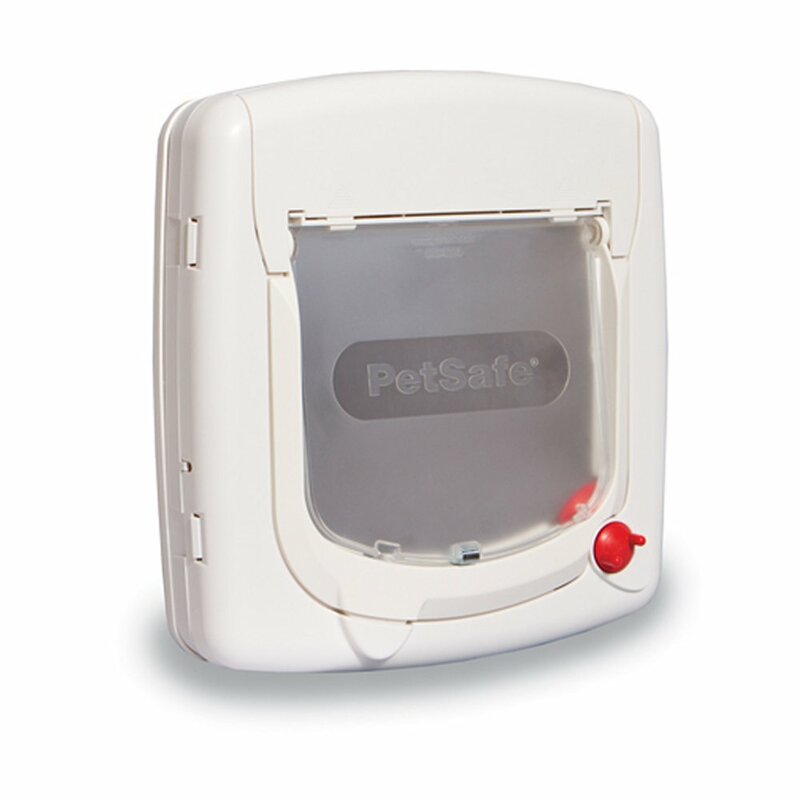 The 4-way locking mechanism allows you to control the access of your cat by manually setting the lock in one of four different settings: In only, Out only, Fully locked, Fully unlocked. The flap is rigid plastic with a magnetic strip along the bottom to hold it in the closed position. 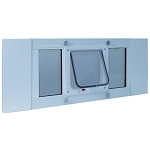 Suitable for fitting into doors, walls or glass to a maximum depth of 2 Inches, however, a tunnel extension is available to allow installation in areas up to 4 Inches deep. 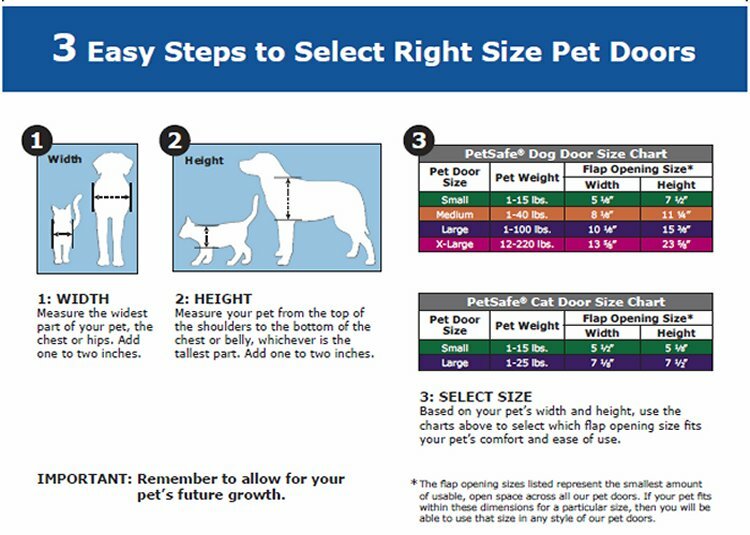 Flap Opening 6 1/4" x 5 1/2"
Maximum Pet Shoulder Width: 5 7/8"
Please use the guidelines listed below to select the proper size door for your pet. 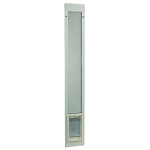 You should select a door that is appropriate for the largest pet that will be using the pet door. 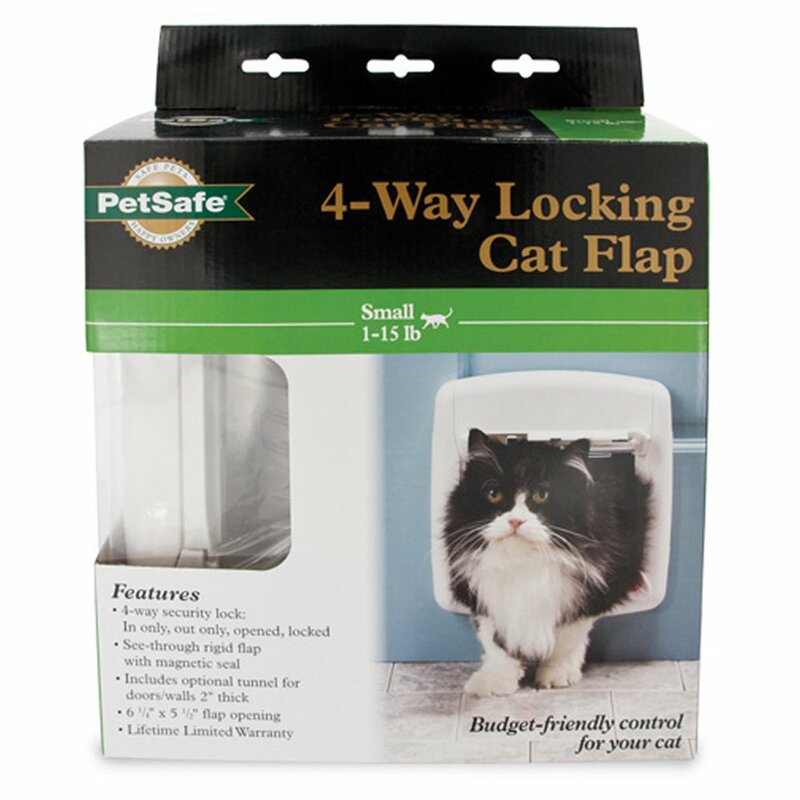 A real nice product that solves a problem in any household where one cat is late coming home! No more waiting up and calling, kitty can get in! The only reason this isn't five stars is that it absolutely MUST be modified before use. Smart cats can push the "locked" door open if they try hard enough because there are only two flimsy plastic tabs on the right side. We drilled a hole in the left side, inserted a plastic sleeve into the hole, then a stainless steel pin slides into and out of the hole to firmly SECURE the left side. We also reinforced the flimsy plastic door by glueing strips of 1/2 inch wide aluminum across the face. Now we have a 100% effective cat door that none of our cats can outwit. If you take the time to beef up this door like we did, you will absolutely, positively LOVE it. My cats had no problem learning to use the door. It was just the right size for medium to large cats. This product is definitely worth it and the price is reasonable as well. This is the perfect pet door for my cats! 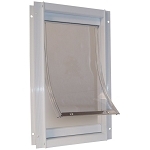 I really like this pet door from Radio Fence, it is perfect for my cats! I was getting so annoyed at them meowing at the door for me to open it, then wanting right back in. This is perfect because I can lock it at night so I don't worry about them going out, and I can unlock it during the day! They love this and it closes well so there isn't a big draft. If you have cats that like to go out, you know they can be annoying begging you to open the door every five minutes. My cats have been loving these pet doors, they can go in and out at their little hearts desire, until night when I can lock it. It installed easily and is easy to use! I bought this door for a sweet little Persian kitten who walked up to me in my yard and basically adopted me. My brother installed it in my metal garage door by cutting a hole in it to fit the cat door. I like the idea of having ways to lock it or not lock it. The kitten figured out with a little coaching with snacks and now goes into the garage when its cold, raining, or both. I am completely happy with the results and highly recommend it! My small cat figured out how to go in and out in a couple of days. Much better than the last one I had that let in too much cold air.